I had recently posted about Process Explorer that is really good tool to see what is going on in your Windows at moment. Truth is that app balances at the edge of amount of information that is still digestible by normal (like in not-system-administrator) human being. Process Monitor on other hand doesn’t know such word as “balance”, it gives complete package. 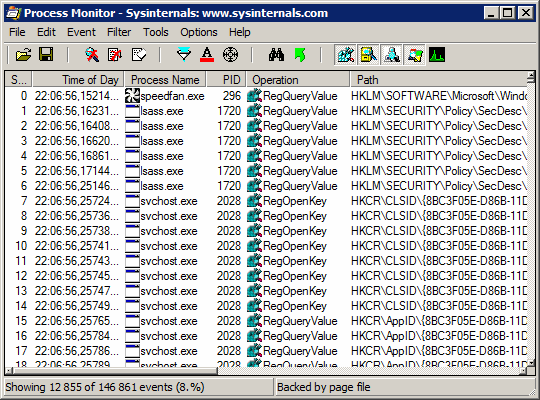 Process Monitor is one of more advanced utilities by Sysinternals . It’s a merge of few earlier utilities and result is program capable of showing everything that goes on deep inside Windows. It is capable of dissecting every single event and presenting it to you. I never really understood how much background stuff is running inside Windows until I’ve seen Process Monitor for the first time. It’s literally hundreds and thousands of events every second . It’s obviously out of human (and even system administrator) range to work with raw stream. Luckily app has very capable filtering system with larger filters by activity type and list of custom ones. Depending on what you are trying to do you’ll have to construct one of several filters that will narrow scope down. Tiny, extremely powerful, as other Sysinternals utilities writes some stuff to registry but works without installation . You may never need this one but nothing can replace this one when it’s needed. One of the most resource-hungry apps ever made. Leave it running and in hour it will consume everything your PC has to offer.